The stadium was first proposed in 2006 and cost a total of €300 million to build. Designed by architects Populous, the Stade des Lumiéres is equipped to host international tournaments and events, beginning with the UEFA European Championships 2016. The arena will host six matches at the event, including a fixture in the semi-final. 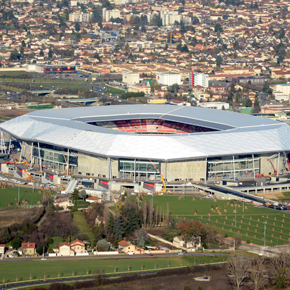 The 59,186 capacity stadium takes influence from ‘Lyonnaise’ architecture and Arsenal’s Emirates Stadium, also designed by Populous. In order to maximise the atmosphere created by the fans before, during and after the match, the stadium is enveloped by a large roof structure inspired by the city’s local forests. The inspiration of the local greenery also extends into the stadium’s car park. Landscape architects AIA Associés created a ‘green car park’ surrounding the stadium which converts to an open park space on non-event days. The structure creates a canopy which amplifies the noise within the stadium and extends over a large part of the podium surrounding the stadium. The roof also helps create a communal space around the stadium, intended to be used throughout the year used for a range of purposes including cafés, stalls, restaurants and shops. In order to create the roof, Serge Ferrari’s Précontraint fabric roof membrane was specified for the project. 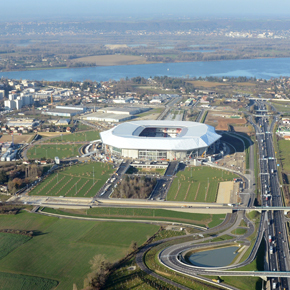 The stadium opened to the public on January 9th as Lyon beat Troyes 4-1. 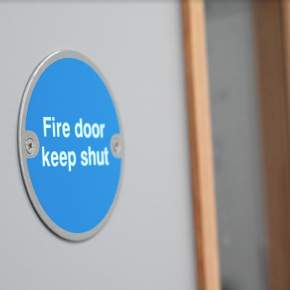 A creator of innovative flexible composite materials since the early 1970’s, Serge Ferrari has been involving in equipping many major sports facilities throughout the world including London’s Olympic Park. Its Précontraint TX30 membrane, which was used on the Stade des Lumiéres, is the manufacturer’s latest generation of flexible composites. 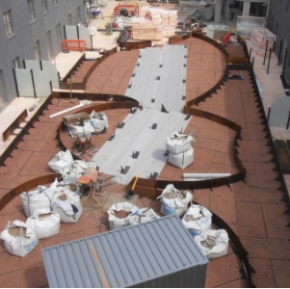 Developed with 30 year guarantee for benchmark project roofing, the material is cross-linked using a reticulating process to create a net-like framework which is durable, flexible and lightweight. The stadium roofing represented a real challenge during building’s development. Traditionally, stadium roofing has to be curved to withstand bad weather conditions such as the weight of snow and strong winds. 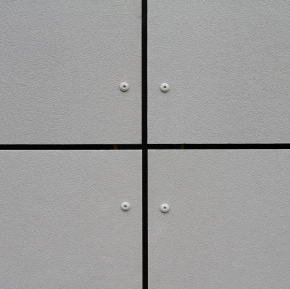 However, Populous presented a design of facetted shapes which posed stringent requirements in terms of tension control. The Précontraint flexible composite membrane therefore played a vital role in providing the dimensional stability required for the material to follow the roof’s geometric design. 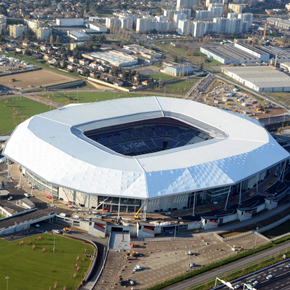 The joint effort between Olympique Lyon, Populous, ACS Production and Serge Ferrari resulted in a flexible and durable roofing solution with an extended warranty of 25 years.